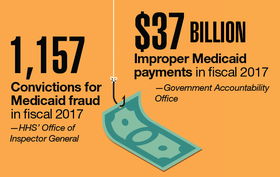 CMS Administrator Seema Verma last week said that her agency is working closely with states, the Government Accountability Office and HHS' Office of Inspector General to root out fraud in Medicaid. She told the Senate Homeland Security and Governmental Affairs Committee that since March 2017 the CMS has implemented 92 GAO and 187 OIG recommendations for addressing program integrity. Nonetheless, she noted, there are still concerns with fraud, especially in Medicaid expansion states. Download the PDF.